A facemask is a loose-fitting, disposable device that creates a physical barrier between the mouth and nose of the wearer and potential contaminants in the immediate environment. If worn properly, a facemask is meant to help block large-particle droplets, splashes, sprays or splatter that may contain germs (viruses and bacteria) from reaching your mouth and nose. Facemasks may also help reduce exposure of your saliva and respiratory secretions to others. While a facemask may be effective in blocking splashes and large-particle droplets, a facemask, by design, does not filter or block very small particles in the air that may be transmitted by coughs, sneezes or certain medical procedures. Facemasks also do not provide complete protection from germs and other contaminants because of the loose fit between the surface of the facemask and your face. Facemasks are not intended to be used more than once. An N95 respirator is a respiratory protective device designed to achieve a very close facial fit and very efficient filtration of airborne particles. The ‘N95’ designation means that when subjected to careful testing and if properly fitted, the respirator blocks at least 95% of very small test particles. To work as expected, an N95 respirator requires a proper fit to your face. Where respirators are used in a non-occupational setting, fit testing, medical evaluation and training are recommended for optimal effectiveness. N95 respirators are not designed for children or people with facial hair. Because a proper fit cannot be achieved on children and people with facial hair, the N95 respirator may not provide full protection. Respirators are not intended to be used more than once. Breathe Healthy® germ, dust, and allergy masks are a “hybrid” that fit neither definition, and lie somewhere in between a medical mask and a respirator. They are superior to a hospital/surgical masks in almost every area. 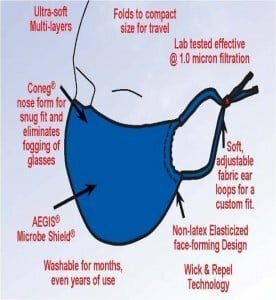 Mainly, they provide the wearer with a better degree of protection by form fitting to the face, and eliminating gaps that allow unfiltered air to enter the lungs. They are also more comfortable, and are not a one-time-use-only mask. The Breathe Healthy® mask provides almost the same level of protection as a “properly fitted” N95 rated mask. However, it does not require a very specific fit process to be highly effective, and is much more comfortable and suited for long periods of wear. We have found that, due to fit testing and training requirements, a “properly fitted” N95 mask is not available to the vast majority of consumers. A properly fit N95 masks is only effective as long as you don’t move or re-adjust it. It is simply not reasonable to expect someone to wear these masks for any length of time without re-adjusting them and subsequently compromising their effectiveness. They are not very comfortable, and difficult to talk through while wearing. The Breathe Healthy® mask itself is not high-tech, but what goes into it is. They are made from a high performance athletic material, designed to be used in close contact with the body. All Breathe Healthy® masks are treated with the AEGIS® Microbe Shield®, which underwent years of research and development and dozens of studies verifying the safety and performance of this technology.